Unprecedented surge of illegals all around us! Illegals Go Home! Thread: Unprecedented surge of illegals all around us! Illegals Go Home! There is now an unprecedented surge of illegals all around us! Interior arrests of illegals in the USA is down under Trump's administration below Obama & Bush levels because agents have been diverted to the border to help assist the fake asylum seeker illegal aliens entering the US. The illegal are almost all being processed and brought into the USA to roam freely among us at taxpayer expense, and the number of Unaccompanied Minors (UAC) is skyrocketing as expected after Trump signed the sneaky amnesty provision in the unread budget bill of February 15, 2019! America and Americans are now in a fight for our lives! Our job is to make this the biggest issue of the 2020 campaign and the battle cry of our candidates needs to be "Don't let these illegals into America in the first place and remove the ones already here! 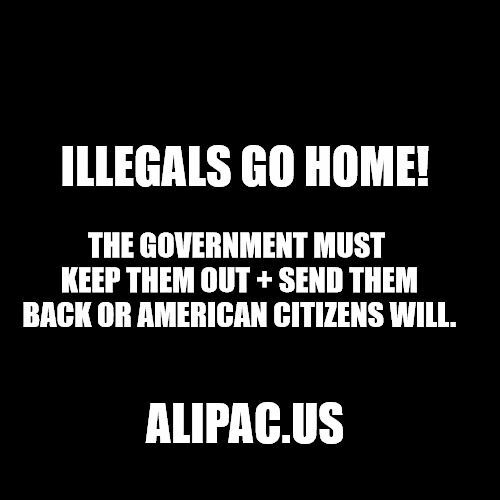 Illegals go home!" Last edited by ALIPAC; 03-25-2019 at 11:29 AM. Beezer and lorrie like this.